As you can see, the online Monkey Business is very different, but at the same time very similar to how it's always been. The same people are organising it, the same people are creating and writing it, and (at least to start with) we've tried to make it not look too different. Articles appear, one to a page, on pages of varying length. To read the magazine, you simply scroll down from the top. One month's-worth of articles will be visible, which will comprise the current issue, plus any additional stuff that may arise such as match reports. Some long articles may be split up, with a 'read more' link at the bottom of the first part. The link will take you to the whole article. To return to the home page, select the 'Fanzine/Home Page' link above the 'cover' page. 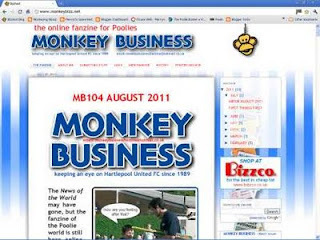 The other links above the cover page roughly correspond with the ones on the old Monkey Business website, and tell you more about contributing to the fanzine, its history, etc. At the bottom of each article are links which enable you to quickly email each article or link it via Twitter, Facebook etc. The panels on the right (at least the ones which aren't adverts), are features used by many websites like this. The Archive panel is a list of all the articles in the online Monkey Business, which are sorted by title, then by month, then by year, so that you can find, not only an article in the current month's output, but also (once we've got more issues under our belt), from previous months. The Google search panel will allow you to search for text articles by any words or phrases that you can remember from them. It may not work properly until the Bizz has been online for a while. The Labels panel is a list of keywords. These are keywords that were attached to each article when it was posted (i.e. put on the internet.) Thus if some articles about H'Angus have H'Angus as a keyword , and you click on the H'Angus link in the list (the number in brackets shows the quantity of articles), it will display all the articles with that keyword. The Followers panel is a list of people who have chosen to follow Monkey Business. You can do that using the blue button, but it's not compulsory, and will be of interest mainly to those who are familiar with social networking websites. We at Monkey Business are hoping that with the help of our readers, Monkey Business can continue commenting, joking and reminiscing like it's always done, and evolve in new directions opened up by the new medium.